Last night I was watching The Lord of the Rings: The Two Towers. I don't know why it was, but the movie really got me thinking about life and the way we lead it. I know, I'm sounding melodramatic, but I didn't even realise it until the last twenty minutes of the film. It was three o' clock in the morning when the movie ended, and one scene rang clearly in my mind while I went to sleep. 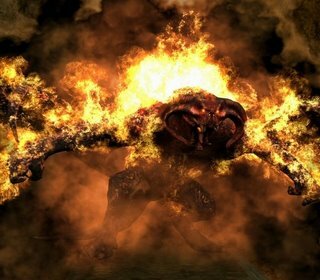 Nothing smells worse then a Balrog's gas. 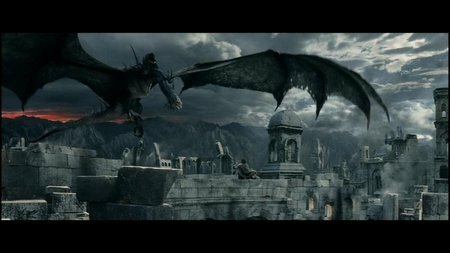 It was the scene where Frodo is about to get snatched up by the Nazgul near the movie's conclusion. He's been completely taken over by the ring, so he doesn't have any choice but to stand in front of this wretched winged beast. 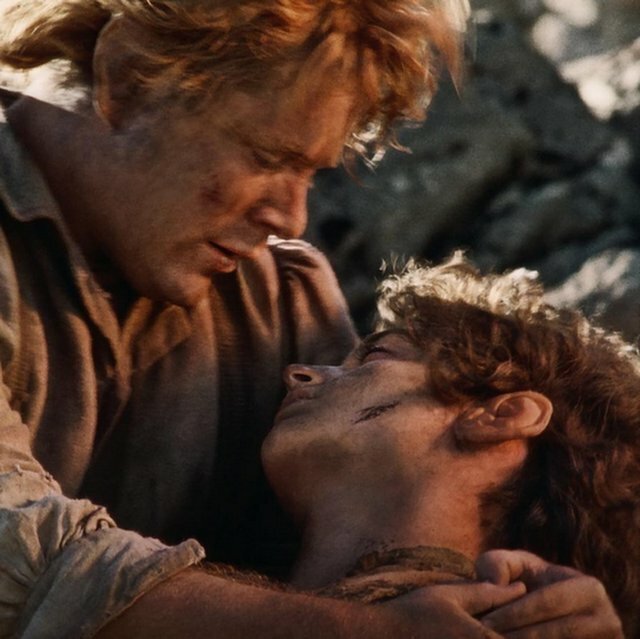 But right at the last moment, when all hopes about to fade, Sam takes him away from it all.. and nearly gets himself stabbed by Frodo in the process. There's a long silence. Sam says, "It's me! It's your Sam! Don't you know your Sam?" Frodo falls to the ground and says in a gentle earnest voice, "I can't do this, Sam". Sam gets up, and gives what is in my opinion, what one of the best monolouges in movie history. Crap!! I think I dropped something! That hobbit probably wasn't important anyways. He starts telling Frodo about the great stories, the ones that really mattered. Full of darkness and danger they were, and sometimes you didn't want to know the end, because how could the end be happy. How could the world go back to the way it was when so much bad happened! But in the end, it's only a passing thing. The shadow, even darkness must pass. A new day will come, and when the sun shines it will shine out the clearer. Those were the stories that stuck with you, that meant something, even if you were too small to understand why. But I think, I finally do understand now. Folks in those stories, had lots of chances of turing back only they didn't. They kept going, because they were holding on to something. Frodo looks at him and asks, "What are we holding on to, Sam?" Sam answers with one of my favorite moive quotes, "That there is some good in this world, Mr. Frodo, and it's worth fighting for." *Brokeback Mountain music plays in background* I wish I knew how to quit you, Mr. 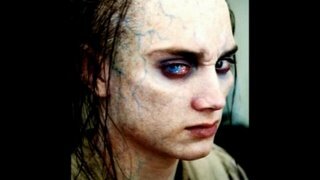 Frodo!! I had seen that scene a dozen times before, but that night it hit me like a ton of bricks. It was a scene that's hard to come by these days, a scene where a character almost completely takes himself out of the situation and compares it to the stoires he was told as a child. Through all of the choas and violence, there's a scene of quiet discovery. I felt a tear go down my cheek, because for me at that moment, the scene represented a huge chunk of my life thus far. Frodo during one of his "emo" phases. As a kid, I always wanted to be Luke Skywalker. Let's face it, you probably wanted to be Luke Skywalker at one point during your childhood. I wanted the adventure and the excitement, but most of all, I actually wanted to be a great person like Luke was. Stories have the power to effect us when we're very young. They have a way of speaking to us, even when we were too little to entirely understand the plot. We're thrilled by the adventures of Indiana Jones and his search for The Lost Ark, but we're also completely emotinally connected to the character. Here's a man who would risk it all to save the rest of us. 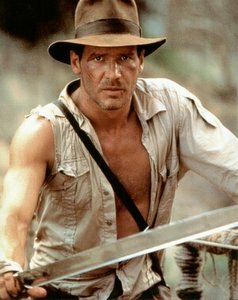 Not many people would take the measures that Indiana Jones did, and that's why the movie spoke to audiences beyond it's action sequences. This is what I used to look like! That was when I was still using the Bowflex. The interesting thing is, as I grow older, the more and more I refer back to stories I knew as a kid. If I'm going through a tough situation, I just think back to a particular scene from one of my favorite movies, and think about what the characters had to go through. It makes my day to day life look incredibly easy! Those guys had to climb mountains, fight orcs, and throw some trinket into an active volcano! Now that's tough! It sounds kinda silly when I put it out there like this, but it's something I think we all do to some extent. That's the entire point of great stories, to give you something to hold on to when you're going through a rough patch. I was sitting there, watching the movie, and all of this washed over me like a flood. The great hereos kept goin, because they were holding on to something. They were holding onto the fact that there is some good in this world, and it's worth fighting for. We all contribute to this world, even if the contribution is small and insignificant. Thanks, Sam! Thanks for the lesson, and the memories! Thanks for the comment, Sakura! You are awesomeness! *Whipes tear from eye* That was beautiful... Ok, I'm going to be serious now. That is very true, everyone needs to cling to something to get through life, like there friends, there family, etc. Nicely said Kaleb, well done. I still say you should be a director. You'd be great. LOL, thanks. But you're not a Star Wars fan, so of course you never wanted to be Luke Skywalker (I still highly disagree with your opinion about Episode 3). I think I'm gonna take a film making class in college. That would be awesome!